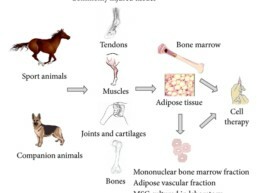 Regenerative medical therapy is a rapidly emerging branch of veterinary medicine in which the body’s own cells are used to heal and ultimately regenerate damaged tissues in acute and chronic orthopedic conditions. The primary interest of this discipline involves treatment utilizing Stem Cell Therapy (SCT) in combination with Platelet Rich Plasma (PRP). It is best used in combination with multi-modal therapy modalities including veterinary rehabilitation plus exercise therapy, laser therapy (i.e. photobiomodulation), acupuncture, therapeutic ultrasound, electrical stimulation, chiropractic, Chinese herbs, etc. Stem cells are unspecialized cells with the ability to self-renew and differentiate into specialized building blocks of organs and tissues. They are classified into two groups based on their origin: embryonic and adult stem cells. They are found in bone marrow, fatty tissue, liver tissue, blood vessels, neurons, etc. and are considered to be the body’s personalized repair cells. They can regenerate and heal injured tissue, supply growth factor, enhance tissue architecture, decrease inflammation, activate resident stem cells and promote tissue regeneration in areas of limited healing capability. The two primary means of obtaining a pool of adult mesenchymal stem cells (MSC’s) is via adipose tissue or bone marrow. Fatty tissue yields a higher concentration of adult MSC’s and is abundant in an animal’s body. It can be easily harvested via minimal surgical intervention and has become the most popular means of obtaining a bank of stem cells vs. bone marrow. Platelet Rich Plasma is an autologous (self-derived) processed plasma (originates from a sample of a patient’s blood) that contains a high concentration of platelets. Platelets contain numerous beneficial growth factors that aid in the healing and repair of tissues via granules that release various growth factors which stimulates other cells of the body to migrate to the area of trauma and facilitate tissue repair and healing. More specifically, growth factors act either individually or synergistically (i.e. in combination with stem cells) to enhance cellular migration and proliferation, angiogenesis (blood vessel development) and matrix deposition to promote tendon and wound healing, aid in bone healing and counteract the cartilage breakdown associated with osteoarthritis. 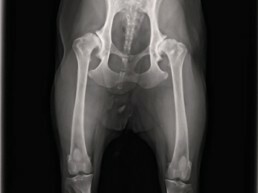 Currently, MSC’s in combination with PRP is being used to improve the lives of animals that suffer from osteoarthritis as well as tendon and ligament damage, joint injuries, intervertebral disk disease, spinal cord injury and bone fractures. It has been shown to be exceptionally effective in alleviating pain and serves as a template for tissue repair in pets with osteoarthritis and joint degenerative conditions that leads to loss of joint function, inflammation, pain and lameness. The therapy usually involves injection of processed stem cells and PRP directly into the affected joint, tendon or ligament. Surgical collection of a pool of stem cells along with blood collection plus processing of these cells into MSC’s and PRP and their subsequent injection into the pet’s affected tissues can take place in a veterinarian’s office all in the same day. Participating veterinary offices are becoming more popular as the success of this treatment becomes more widespread.